love the sleeping dog in frame three… apparently it’s completely conditioned to ignore street violence. You use lots of different weapon designs (4 dif. guns in 2 pages), do you plan out their designs ahead of time, or do you make them up on the spot? Sweet, we can post, I never noticed that. I just wanna say, this is an awesome world and an awesome story, but most of the city has been… a little too busy I guess. It’s a little hard to figure out what’s going on at times. This page is better, the people you need to pay attention to stand out more. For the more featured weapons, like those used by the main crew or the Jondhi police guns, I concept them ahead of time to make sure I find a look that I’m really happy with. 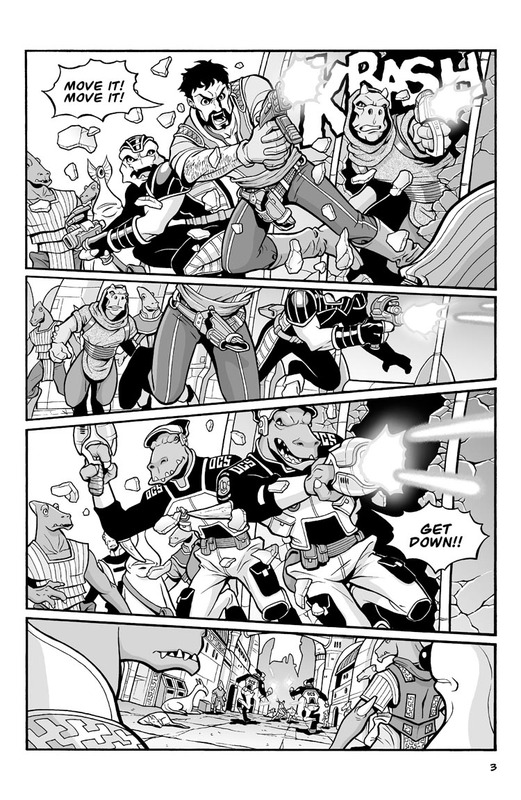 For some others that might not be quite as important, like Hamron’s crew, I make them up as I draw the page. That applies to ships, aliens, and architecture as well. In a perfect world, I’d concept everything ahead of time, but given the workload and time it takes to actually produce the comic itself, some stuff doesn’t really warrant the time to concept in depth. Hey Jallorn, thanks for the nice words. Glad you’re enjoying the world and the story. Sorry if some of the art has been a bit busy for you. In general I try to squeeze in a lot of detail, but never at the expense of legibility, since it’s important for me that the scenery doesn’t overwhelm the actual characters or story. Maybe I could have desaturated some of the black lines in the backgrounds to push them back from the foreground elements a bit more in the busier panels. Very nice page. Really evokes a cinematic feel with the slanted frames like the shaky camera in modern action sequences. The shocked stillness of the bystanders’ faces combined with the one oblivious animal and the one raising its head show how fast and sudden the scene is, but it all flows smoothly and as Jallorn said it’s easy to keep track of the characters in the action.